Exterior environments provide a special challenge for resurfacing. 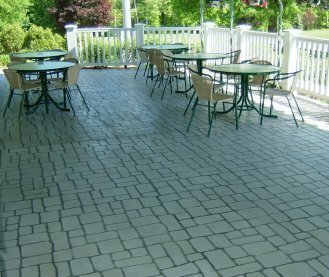 In our many years of experience, we have found that cementations acrylic toppings provide a great look and durability for outdoor applications. 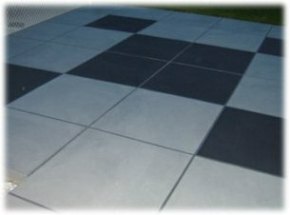 Many colors and design patterns are available to create the look you want, and provide years of protection for concrete. These products are primarily designed from polymerized synthetic rubber, resins and specially graded cementitious aggregates. This system provides a water repellant surface that is resistant to freeze-thaw cycles, and provide visual interest through a wide range of color and texture patterns. 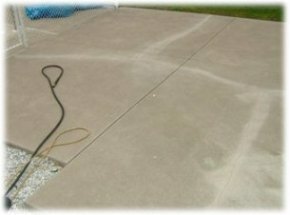 Concrete surfaces are first properly prepared and repairs are made to slabs. Acrylic topping can be applied on one solid color, multiple colors, or specific patterns. Surfaces are then sealed with an easily recoatable acrylic top coat. Acrylic toppings material provides an extraordinary bond to properly prepared concrete and wood surfaces. These type of toppings can be applied by spray, brush, roller, or trowel. Different application styles and color blending can create unlimited custom designs. This system is a breathable product which allows normal vapor transmission to pass through it without lifting or blistering. 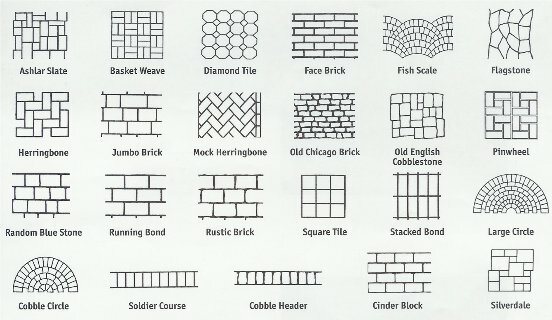 Below are some standard pattern samples commonly used to create many different designs. Different patterns can be combined and custom details can be added to produce a unique look. Many hand made patterns not listed can create the look of irregular stone patterns or custom graphics.